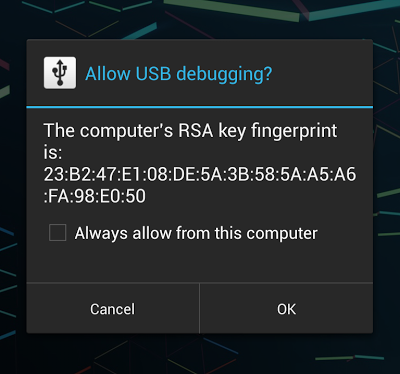 When you connect a new PC to a device for debugging android apps, it doesn't initially work. In Android Device Chooser, the window displays the device serial number and Target shows 'unknown'. This is because the PC needs to be registered with the device. Disconnect the USB cable and reconnect it. On the device the window should appear. Click OK to register and authorize the PC.